Gamers are often pegged as heartless, cruel sociopaths who’re only too happy to ride over their own grandmothers for a high score. Well, that may be true (How is your gran doing, Darryn?) but they also have a softer, gentler side. 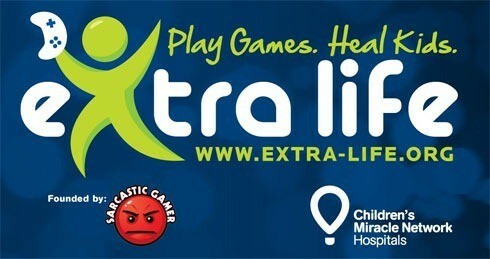 South African gamers Aaron James and Bryleigh Beaumont of Thatsadealbreaker are showing that side by participating in this year’s Extra Life – an international charity drive that has gamers playing for 24 hours straight, all for the benefit of sick children. That’s awesome – but they need your help. The team is trying to raise a $100, which will end up going to the Extra Life international grant fund – which ends up being distributed to children’s hospitals all over the world. $100 may not seem like all that much, but every little bit helps. According to their Extra Life page they’ve managed to raise $72 dollars so far through the generosity of just two sponsors – but I think we can do a little better, taking the tally far, far beyond $100. The whole thing goes down on October 15th – and hopefully the team will have far exceeded their goal by then. Let’s do it! To make an online donation please search for one of the participants and then click the “Support This Participant” button on their page and show how much gamers care. I know that it’s gaming nirvana at the moment and there’s a flood of new releases you’d like to get your hands on, but a few bucks for an excellent cause isn’t going to get in the way. You can find out more of the subtleties with regards to making a donation over here.